courtesy of Coachella Valley Music & Arts Festival. Everyone knows that sometimes the best way to appreciate where you live is to get away for a little while. It is also true that sometimes the best way for a music critic to reboot his love of music is to attend an awesome music festival without an impending review deadline hanging over his head. This past weekend I did both when I attended the Coachella Valley Music & Arts Festival in Indio, California. 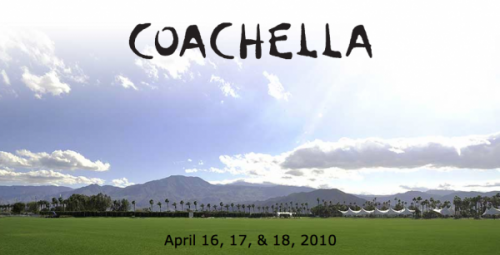 This was my third Coachella (2004, 2007*, 2010) and I think it is without a doubt the best music festival in the United States. After a three-legged, 12-hour journey by plane, I made my way into the California desert to enjoy some of the best music on the planet for three days. The weather was beautiful, the music was excellent, and I got the re-charge I was looking for. I decided to write mini-reviews of the bands I caught and to post them here for those who follow my music writing. Keep in mind, I was focused on enjoying the music this weekend without my reviewer’s hat on. So these little reviews are more personal and less detailed write-ups of the bands I saw over this great weekend.